We were first alerted to a potential opportunity in NEC through a large industrial and commercial property owner and developer. Over lunch, our industry contact was discussing many changing aspects of his property and business / tenant dealings, with one subject particularly relevant to the changing landscape for NEC. One that potentially could see the current re-rating of the company’s shares continue to ~+$3.00 per share. The key aspect we identified in our discussions was regarding an existing tenant of the property owner, a business that relies heavily on advertising to attract customers through their doors. We noted that the business had been advertising heavily on FTA (Free To air) TV stations for ‘years’ because it was not only ‘cheap’, but because the results they continued to enjoy from this spend were ‘good’. At the time of our lunch, our contact noted a recent discussion in which the said tenant had mentioned in passing that this dynamic had suddenly changed - TV advertising had become ‘expensive’ and that they were forced to switch over to radio as their core advertising medium. 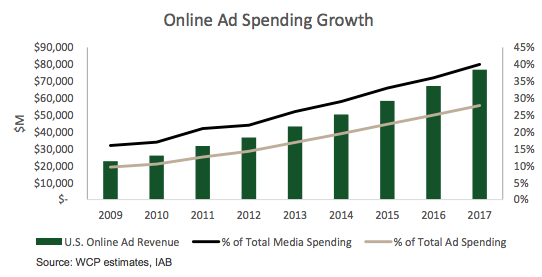 To diverge from this a little, we also recently note comments made by Health insurer Medibank Private who said Google's dominance over digital advertising has led to ever- escalating costs and an ever-decreasing return on investment. In one of 57 submissions to the Australia Competition and Consumer Commission's Digital Platforms inquiry, Medibank said there were "no realistic alternatives" for advertisers in the digital world. Since being listed in 2013, we have generally held the view that traditional Free-to-air (FTA) television was and continues to be disrupted with more and more viewers abandoning FTA and consuming media content via other digital channels such as mobile phones, tablets and on-demand streaming services because “I’ll decide what media programming I watch and when, not you”. Our view has not changed here. This is structural, enduring and there is very little an incumbent of old-technology can do to change its spots quick enough with disruptor business models already at scale and building brand awareness daily. Think Netflix. Advertisers will simply change their medium of advertising to where eyeballs are going. If you offer new age TV content and delivery, good. If you don’t, then you are unfortunately caught between a rock and a hard place. Based on overseas markets, time is not FTA’s friend. In recent months however, this dynamic appears to have changed somewhat and swung back into NEC’s favour. In our view. A key metric most business owners and investors focus on is the Return On Investment (ROI). If I spend $100 on advertising or ‘customer acquisition costs’, what will / what was the return on that spend? If that $100 turns into $500 of gross profits, that’s obviously a good ROI outcome. If that same $100 now costs $450 via Google / Facebook etc... and I’m still getting $500 in gross profits in return, well that’s not so good and its highly like that one would to start to consider the alternatives. And in doing so, potentially switch to alternative advertising strategies with a better ROI – assuming one exists of course. This is what appears to be happening right now. If the costs of advertising are indeed going up at the same time the return on that investment is falling, there are still plenty of people (and hence eyeballs) watching FTA TV and hence it appears we are seeing advertising dollar spending shifting back to FTA TV given the ROI online vs. via FTA are potentially at bit of an inflection point – at least in the short-term. This is evident in NEC’s first-half result where Nine booked an increase in FTA TV revenue (along with digital) for the first time in several periods. This coupled with a reduction in costs due to government regulation changes where the licence fee paid by free-to-air (FTA) TV broadcasters was reduced from 3.75% to 0%, saw earnings jump 55 percent. That was good, but it gets better - the trends have persisted. In a recent trading update post the half-year result, free to air revenues were trading around 5 per cent higher than last year, and core digital revenues were pacing around 21 per cent ahead. Add to this the fact that EBITDA guidance for the year is expected to be between $250 and $260 million, at the upper end of the range previously provided to the market and which compares to $205m delivered in 2017, NEC could again see impressive growth in earnings. And this guidance could potentially be conservative if current trends continue / with further growth in free to air share in a stabilising market, a clear cost benefit from the change in summer sports from cricket to tennis and strong growth from 9Now and digital publishing with Stan almost at breakeven. 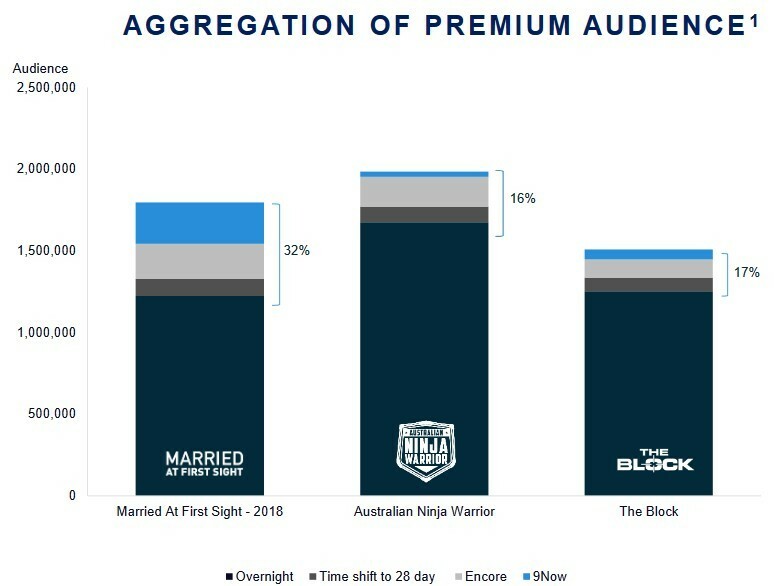 1 rating point is worth ~$25m EBITDA and with Channel Ten facing a multiple of issues, they are likely going to effectively throw this money to their competitors which obviously this leaves the door open for NEC to take further market share with several key content shows (indeed two of their largest) being released soon in Ninja Warrior & The Block. Should these favourable trends persist, our view is if they don’t upgrade this year, then all of this should then flow into 2019. And so in the short-term, the TV market is growing again which helps revenue & sentiment. Costs have fallen due to a change in Government regulations which when coupled with lower content costs (shift from cricket to tennis rights) and with Stan almost at cash-break- even, NEC hitting their guidance this year is not a stretch in our view. Indeed, with a few additional ratings points likely in the bag from Ten and the FTA advertising market growing, we could see the group doing >$300m EBITDA versus consensus estimates which are currently sitting at $266m for 2019. Global TV multiples currently sit around 8-9x EBITDA 2019 which at the upper end of that range sees NEC worth an estimated $2.7b versus its current $2.2b capitalisation – that’s about $3.10 according to the current level of shares outstanding or 24 per cent estimated upside from current market price levels. So even though EPS upgrades up until this point have been strong, it appears in our view, there is more to go.